Aquamarine, the birthstone for March and for the Zodiac sign Scorpio, is one of several gemstones derived from the mineral beryl. With a vitreous luster and a color that ranges from pale to blue-green to deep-blue, it shares several properties of Emerald, the rarer deep-green stone also derived from beryl. However, aquamarine bears several qualities that differentiate it significantly, even preferentially, from the emerald, making it a superb choice for any engagement ring. The most important differentiation from emerald is the aquamarine’s lack of flaws. Emeralds are rarely flawless, and in fact crack very easily. They require delicate care and cool temperatures to remain intact. While the stones are durable, a quality of beryl, it is difficult to be completely comfortable while wearing an emerald ring, because enough pressure or heat will cause internal cracking in the emerald very quickly. Aquamarines, however, do not have this problem. While the emerald’s flaws can be hidden with oil treatments, an aquamarine is naturally flawless to the point where creating synthetic flawless aquamarine is a profitless enterprise. Aquamarines, by their name and by their color, are reminiscent of the ocean. The lush blue tone of the more expensive aquamarine makes for a wonderful engagement ring for anyone who harbors a fondness for the sea. For this reason, many light aquamarine stones are heat treated with temperatures as high as 750˚F to cultivate the deep blue color. A stone from this kind of heat treatment is more expensive than a typical aquamarine, and it loses the light green tint. Heat treatments tend to remove flaws from gemstones, and so an aquamarine that goes through the heating process will be flawless, but that does not mean that the stone is forever free from developing flaws through use and pressure. These stones lose their blue richness if exposed too long to bright light. Like the emeralds, they will also develop internal cracking if enough force is inflicted on them. Regarding price, the cost of an aquamarine engagement ring depends on the quality of the aquamarine and, obviously, of any surrounding diamonds. For the most precious dark aquamarine stones, in the .5 to 1.5 carat range, the gem is worth roughly $400 per carat. With a 3 carat stone, an aquamarine piece might sell for as high as $1000 per carat, although the average is about $600 per carat; for 3 carat plus, the dark Aquamarine would run at approximately $800 per carat. For lighter and medium aquamarines, the prices can drop dramatically. The lightest aquamarine could sell for $100 or less. Generally, the premier jewelers like Tiffany and Co. will only sell the finest aquamarine gems, and other companies like Blue Nile and Zales, both of which cater to wider consumer bases, will sell the more affordable aquamarine stones. Blue Nile, for example, sells a beautiful aquamarine ring (“Aquamarine and Diamond Ring”), the stone prong set in white gold and flanked by two diamonds, for approximately $900, excluding taxes; the same style of ring at Tiffany and Co. (the “Tiffany Legacy Collection Aquamarine Ring”), with the stone set in platinum and surrounded by brilliant white diamonds, runs at $7750, with the maximum $1000 being charged per carat. Whatever one’s price range, it is critical to purchase an aquamarine stone from a trusted jeweler, as many suspicious dealers will pass off cut-rate Topaz as aquamarine. 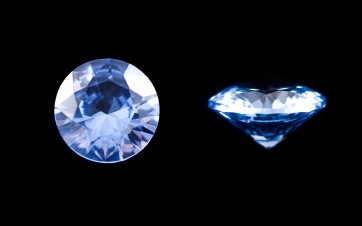 Such forgeries are difficult to spot by the inexperienced consumer because aquamarine and topaz often share an identical color and have similar physical properties. The clever consumer can spot an aquamarine forgery by the hardness of the topaz and its stronger refraction than a typical aquamarine gem. Even for the most cunning customer, however, it is best to deal with the established jewelers (Zales, Tiffany’s, etc.) that deal honestly with their clientele. A quality jeweler will size any aquamarine engagement ring according to the exact specifications and make any other necessary adjustments. Like all stones, the aquamarine has folklore associated with it. It is said to be a healing stone, worn by sailors to keep them safe from the rough seas. It was also believed to increase its wearer’s intelligence, promote thought, reduce anxiety and, among Middle Ages teachings, minimize various poisons. According to lore, aquamarines are terrific gems to present on 16th and 19th wedding anniversaries; a romantic play on this concept would be to present an aquamarine engagement ring on the 16th or 19th month anniversary of some occasion. It also makes a terrific engagement gift in march, as it is March’s birthstone. Whatever the time or occasion, aquamarines are rare, beautiful gemstones that make memorable engagement rings, and are readily expensive or affordable according to the buyer’s needs. The word aquamarine comes from the Latin “aqua marina”: sea water; for its blue color, it is sometimes referred to as “the stone or the sea,” or “the gem of the sea”.